In this section, you'll be able to view the videos updated every month and see the construction of the Bio-on plant in Castel San Pietro, Bologna as it develops. A new production plant dedicated solely to special PHAs production for advanced niche products in rapid development and not in competition with the large-scale plants licensed by Bio-on around the world for PHAs output from 5,000 to 10,000 tons per year. This new plant based in Castel San Pietro Terme in the province of Bologna has 3,700 covered m2, 6,000 m2 land for development and a total area 30,000 m2. The plant has a capacity dedicated to the research into and production of 1,000 tons per year rapidly expandable to 2,000 tons per year. The plant is equipped with the most modern technologies and the most advanced research and development laboratories. New agricultural waste carbon sources for producing biopolymers are continuously tested to increase the range of technologies offered by Bio-on. Bio-on Plants is a new company set up by Bio-on to meet the increasing number of requests in PHAs production (polyhydroxyalkanoates) for special uses. Bio-on Plants is an exclusively productive unit for the study and development of PHAs through bacterial fermentation using the technologies developed by Bio-on and licensed around the world. The mission is to create new production of special biopolymers and at the same time offer a new range of products to be licensed all over the world. Bio-on Plants produces the varieties of MINERV PHAs invented and developed by Bio-on S.p.A.'s technicians. The Bio-on Plants logo and all rights pertaining to it are the property of Bio-on spa. MINERV is the logo owned by Bio-on spa for the generic production of Polyhydroxyalkanoate or PHAs - a linear polyester produced naturally through the bacterial fermentation of sugar. The family includes over 100 different monomers for producing materials with extremely different properties. Thermoplastics or elastomers can be created, with a melting point varying from 40 to over 180°C. MINERV-PHA is a high-performance PHA biopolymer. MINERV-PHA has excellent thermal properties. Through characterisation, it is possible to meet production requirements from -10°C to +180°C. The product is particularly suited for the production of objects by injection or extrusion. It also replaces highly polluting products such as PET, PP, PE, HDPE, LDPE. The MINERV logo and all rights pertaining to it are the property of Bio-on spa. Bio-on Plants offers a vast range of products for use in the cosmetics and biomedical sector. The characteristics of the oil-based products used today in these fields can be replaced by MINERV PHAs. The particular conditions designed in production enable the immediate use to replace microbeads (micro-particles of plastic) in the cosmetics sector. A number of associations are active in different parts of the world. The associations are particularly focused on constantly communicating the problem surrounding the use of polymers in beauty products (cosmetics). Since 2013, they have strongly denounced the problem of ocean pollution caused by some cosmetics and body care products, particularly skin exfoliants. This category of products has become the figurehead in a series of products (e.g. shampoo, creams, make-up and many more) cited in the recent law proposed in the USA and accepted by various states in the union. The official publication of this new USA law, which prevents the use of oil-based polymers in body care products and particularly the category defined as "exfoliants" by the Obama administration (President of the U.S.A.), generates an enormous opportunity for the platform products generated by Bio-on (PHAs, Polyhydroxyalkanoates) as well as its particular applications, as is the case with the new patent for the beauty products sector called minerv pha bio cosmetics type C1. The stance taken by the USA against the plastics that in nano and micrometric dimensions form polluting Microbeads is aimed exclusively at the "conventional" polymers widely used in cosmetics, as stated in the law: polyethylene (PE), polymethyl methacrylate (PMMA), nylon, polyethylene terephthalate (PET) and polypropylene (PP). Oil-based polymers not compostable in the environment not only pollute by their very presence but also increase pollution due to the prolonged periods that they persist in the water and soil. Replacing these oil-based polymers with bio-based polymers or even biopolymers would not change the problem of pollution in the environment and, particularly, in the seas. We believe that the only choice capable of producing real change is to pursue not just Plastic Free Seas, but Microbead Free Seas. This is easy to achieve, using polymers that are truly capable of being completely broken down by the bacterial component within a short time and, therefore, not capable of forming Microbeads. For this problem, the time taken for biodegradation and the metabolites formed as a consequence of this degradation are very important. Minerv bio cosmetics guarantees a relatively short persistence of PHA in water and soil and that the derivatives of bacterial aggression are biocompatible, and even useful to the environment as nutrients for micro-organisms (a very positive factor for the environment). Bio-on has a unique opportunity to propose to the cosmetics world to safeguard the environment without reducing the performance and effectiveness of their products by using bio-based PHAs, which does not accumulate in the environment because it is broken down by the bacterial component into molecules and metabolites, the presence of which is not only NON-toxic or harmful, but in certain aspects even necessary to feed specific biological processes, growth of plants, micro-organisms and insects. Since 2007, Bio-on has been constructing a more sustainable future for the plastics sector, with proprietary know-how regarding the production of PHAs (polyhydroxyalkanoates), which are considered the best biopolymers by those consciously looking to the future. PHAs are plastics made 100% from renewable waste plant sources, with no competition with food supply chains, and are 100% biodegradable in a variety of environmental conditions, without dispersal of residue following biodegradation. Bio-on designed and patented the world's first fully bio-based PHAs plastic (certified since 2014 by the United States Department of Agriculture - USDA) and 100% naturally biodegradable in water and soil (certified since 2008 by Vinçotte) without the use of chemical solvents. This exceptional product is obtained through the natural fermentation of bacteria fed by by-products from the agricultural industry (no human food). Bio-on biopolymers have exceptional properties that adapt to the injection and extrusion methods currently in use in the plastic industry and can cover a vast range of strategic applications: biomedical, packaging, design, clothing, automotive and many more. These are new biocompatible complexes, including a polyhydroxyalkanoate (PHA) and a biomimetic inorganic compound, that can be used advantageously for the formulation of cosmetics and personal care products. The complex can act not only as a biodegradable polymeric component that remains for long periods on the skin and hair keratin even after prolonged rinsing, but also as an innovative carrier and dispenser of specific active substances, the bio-activity of which is prolonged after each application. minerv bio cosmetics (type C1) brings together respect for the environment and human health. Made from agriculture-based carbon sources, it is not made from oil-based products, but from the atmospheric CO2 captured by the crops from which it is made. It is totally biodegradable, unlike any other biopolymer, and respects the environment. PHAs molecules are also present in the human body; they are biocompatible and naturally absorbed once their action is carried out. Everyday products such as lipstick, lip gloss, mascara, eye-liner, nail polish, creams and shampoo contain plastic polymers, especially in the form of microbeads. To date, all the plastic polymers used in the cosmetics world are obtained from fossil fuels, oil, and hydrocarbons in general. This apparently limited yet immense worldwide use implies the extraction of oil, increased greenhouse effect, and the dispersion of non-biodegradable material into the environment. This non-biodegradable oil-based plastic permeates the natural cycle down to the plankton in the rivers and oceans. Plankton is able to swallow the microbeads, thereby introducing them into the food chain. All of these environmental impacts disappear with MINERV PHA; since it is biodegradable, PHAs microbeads do not accumulate in the environment. What is more, it is a bio-compatible and naturally bioabsorbable material coming into contact with the skin, lips, hair and mucous membranes. Another important aspect: Bio-on has discovered that minerv bio cosmetics type C1 is capable of binding active molecules and antioxidants, such as coenzyme Q10, vitamins, proteins, and active substances in general, transporting them naturally to parts of the body where cosmetics products are normally applied. After having located the active substance where it must act, MINERV-PHA is naturally washed off or absorbed without a trace. MinervPHA Bio Cosmetics is the new range of intermediate products for cosmetics, designed to makes beads suitable for all uses in the cosmetics industry. The natural alternative to polyethylene beads (PE). Their special characteristics modify the structure of the cream, varying its adhesiveness and giving an "elegant feeling". The micropowders in the MinervPHA Bio Cosmetics line are hydrophobic, so they do not absorb the skin's humidity, and highly lipophilic, which means they are very good at absorbing oils and sebum. The latter characteristic gives even the greasiest skin a natural matt look. A further optical effect of MinervPHA Bio Cosmetics micropowders is the excellent Soft Focus they provide, i.e. the ability to flatten wrinkles and creases in the skin and add brightness to the face. Thanks to patented technology, this line of products based on micropowders for texturing incorporates a wide range of active substances (UV filters, anti-ageing, antibacterial, anti-cellulite, toning, etc.). The biodegradable carrier shell provides more effective, stable and processable protection than the unstable ingredients susceptible to chemical degradation found in conventional formulations. The polymeric structure also guarantees a more controlled, longer-lasting release. The industrial process developed by Bio-on has features that are unique in the technological panorama of the production and commercialisation of biopolymers. Our process allows us to focus on peerless "naturalness", since we do not use organic solvents and do not genetically modify bacteria and plants. These aspects enable the successful use of the PHAs obtained from the Bio-on process in many food applications and applications directly linked to living beings, both intracorporeal and extracorporeal. This is why we have already successfully developed scaffolds for the production of bone and arterial tissue. All of these products further enrich the Bio-on products portfolio. The new line of minerv bio cosmetics products is now available for finalising their use in myriad cosmetics applications. Our research and development team has developed an intense product development schedule for the 2016-2020 period, in part thanks to the replacement of the polymer particles used today in toothpaste, shampoo, exfoliants (those cited in the USA law), face make-up, tanning and sun creams and many other cosmetics products. Bio-on is willing to collaborate with other private research centres to develop new vertical applications of minerv bio cosmetics type C1. Our products, based on a polymer obtained through fermentation and 100% naturally and totally biodegradable in a short time (especially in small particles) in soil and water, is currently the most advanced product in the world for easily replacing the plastic used in all beauty products without any legislative limitation. Bio-on researchers on the job. For the very first time, bioplastic can be used to diagnose and treat tumours thanks to the first patent registered by Bio-on in the nanomedical field, particularly in nanodiagnostics (nano-imaging). Bio-on researchers use nanotechnologies to create minerv BIOMEDS: these are revolutionary and innovative nanocapsules in PHAs bioplastic (polyhydroxyalkanoates) capable of simultaneously containing two contrast media: magnetic nanoparticles and gold nanocylinders. These two elements flag up diseased areas of the body, e.g. a tumour mass, using traditional Nuclear Magnetic Resonance and the more innovative Photoacoustic imaging*. "Using PHA bioplastic is very advantageous because it is safe for the patient and has no side effects. These products are safe for the environment and human health, especially when it comes to biomedical applications. Bio-on bioplastics fully meet these requirements and open up important, unexplored fields for nanotechnologies in medicine - a rapidly growing sector." This technology has a diagnostic as well as a therapeutic function, given that drugs can be inserted into the nanocapsules, for chemotherapy for example. This will enable minerv BIOMEDS nanocapsules to be used in targeted and selective cancer therapies in the future. Combining Therapeutic with Diagnostics has led the two terms to be fused, thus creating Theranostics. This versatility makes nanocapsules multifunctional and this dual system will allow clinical theranostic applications in oncology and in neurodegenerative disorders, enabling medical professionals to work safely on patients. The PHAs bioplastics developed by Bio-on are made from renewable plant sources with no competition with food supply chains. They are completely eco-sustainable and 100% naturally biodegradable. The research conducted and the patent registered by Bio-on show that they can be used successfully in the nanomedical field precisely because they are biocompatible and safe for human health. The global market in contrast media alone is dominated by four multinational companies that generated an overall turnover of $4.3 billion in 2015. According to the most recent estimates, this figure should rise to $6 billion with 39.5% growth over the next 5 years. By synthesising inorganic and organic systems, Bio-On enters the field of biomedical and pharmaceutical applications through Theranostics - a term coined by blending Therapeutic and Diagnostic. minervBiomeds innovative nanocapsules have a diameter of 80-100 nanometres and are made of polyhydroxyalkanoates. Therapeutic applications in oncology are in the controlled and targeted release of cancer drugs. Thanks to its being biocompatible and the possibility of directing the nanocapsules, minerv-Biomeds product can be delivered selectively to the diseased area, releasing the drug where it is needed and eliminating side effects on healthy cells. minervBiomeds nanocapsules can also incorporate smaller biocompatible metallic nanoparticles (20-30 nanometres) for diagnostic applications (imaging). These metallic nanoparticles can be spherical or cylindrical and are iron oxide nanoparticles with magnetic properties and gold nanocylinders with plasmonic properties, respectively. With the magnetic nanoparticles, we can perform Nuclear Magnetic Resonance using a product safe for human health and view diseased areas effectively. With plasmonic gold nanocylinders, the innovative photoacoustic technique will enable high resolution images of diseased areas with greater sensitivity than conventional techniques. Photoacoustic imaging is an innovative, revolutionary and non-invasive technique that produces extremely high resolution images of diseased areas of the body. It is highly precise and very safe because it does not use ionising radiation. development of the fermentation technology and the development of the use of PHAs in the most advanced sectors. Equipped with fume cupboards for chemical synthesis and separation with workbenches under suction hoods. Laboratories equipped with glassware for reactions, separations and preparation of samples for chemical analysis. The laboratories also have instruments for blending, discontinuous and continuous batch formulations, ovens, centrifuges, instruments for analysing chemical structure, molecular weight and more. The cellular biology part of the lab is particularly useful for the cosmetics field, since it includes extractor fans plus bench-top sterile hoods with UV lamp. -studying various types of feedstock tested for PHA production. Particular attention is paid to aseptic conditions in cell preparation. -industrial for special products in 2018. Mechanical and electronic parts are subjected to a constant process of improvement in line with the relative technological advances. Particular attention is paid to fermentation data detection systems and to process parameter management systems. Bio-on is working on a processor to produce PHA from CO2. The microorganism Cupravidus necator has the metabolic ability to accumulate PHA by metabolising CO2 and converting it to PHA, with an autotrophic process. The heterotrophic process from agricultural by-products also basically derives from CO2, captured by cultures through photosynthesis and transformed into carbohydrates and lipids in plants. During the industrial transformation phase, the sugars and fats then go into the transformation by-products, such as molasses and raw glycerides, an optimal carbon source for fermentation processes. less CO2 in the air, with a consequent reduction of the greenhouse effect. The selection and improvement of the microorganism used for synthesis is being continuously developed. 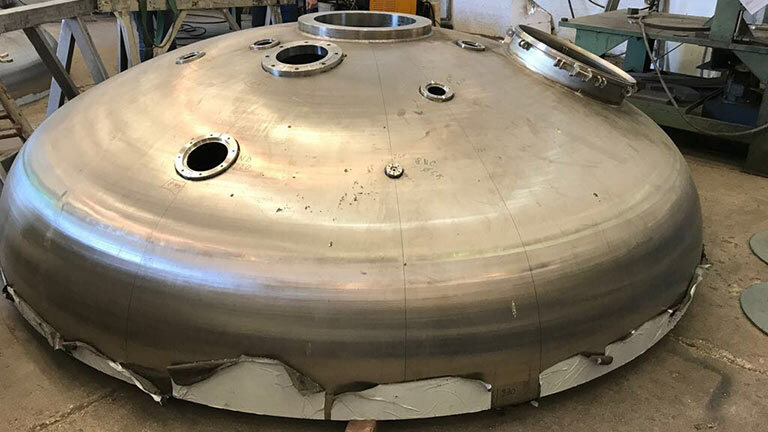 An advanced engineering phase is currently setting out the characteristics of fermenters suitable for this cutting-edge technology. The main obstacle to overcome in the industrial application of this new scientific and technological frontier is capturing from the air and the low solubility of CO2 in water. bearing in mind the need for a solid industrial-scale application to be implemented. Bio-on makes characterisation grades on request. Our laboratories choose a well-known, landmark plastic product to be characterised based on Bio-on's technology for producing PHAs from sugar beet or sugar cane by-products or other agricultural waste. (*)having identified the PHAs corresponding to the macro-family (e.g. : PP polypropylene), the individual grade is identified and characterised for a very precise use in terms of mechanical, physical and thermal properties. The technology for producing Minerv-PHATM features successive sub-processes that transform the carbon sources contained in agricultural co-products into polyhydroxyalkanoates (PHA), whose properties enable them to replace many oil-based plastics at commercial level, with the added benefit of being biodegradable. Polyhydroxyalkanoates (PHA) are biodegradable in compost, like other bioplastics, but also in free water, a unique property thanks to the metabolic activity of microorganisms naturally present in the environment. The Bio-on technology was designed to respect and enhance the eco and bio character of polyhydroxyalkanoates (PHA). The two platform products have considerably different characteristics, enabling different types of non-biodegradable, conventional plastics to be replaced. Indeed, PHBVV is a family of molecules the flexible nature of which enables it to be modulated according to the needs of the application. The fermentation process is based on the ability of a bacteria microorganism, of the Ralstonia eutropha species, to metabolise carbon sources and convert them to polyhydroxyalkanoates (PHA). oils and fats of various origin. - we have several vegetative propagation phases in a series of fermenters, in order to separate productive time from the dead time of biomass growth. The microorganism used is entirely free from pathogenicity, so there is no danger to operators or those living in the surrounding area. -to obtain a high yield of polyhydroxyalkanoate (PHA) per unit of time. - preparation of feed solutions integrating the bacterial metabolism. At the end of the fermentation process, the resulting broth rich in polyhydroxyalkanoate (PHA) is rapidly removed in order to wash and sterilise the fermenter in preparation for the subsequent inoculum. The purpose of the recovery phase (the term used in the fermentation field) is to extract the molecule in question from the fermented broth mixture, until obtaining a highly pure raw product, which is refined to commercial level in the purification phase. At the end of the process, the microorganism has a biomass of up to 80% polyhydroxyalkanoate (PHA), contained within the cell wall; therefore the purification phase of Bio-on's technology is part of the family of processes in which extraction involves the destruction of the cell. 20% of the biomass is made up of protein, plasma membranes, cytoplasmic content in general, treatable with standard purification processes. The merit of Bio-on's technology, designed firstly to maintain its eco credentials and secondly to guarantee the biobased origin of the carbon contained and used in the process, lies in the fact that it does not use organic solvents such as chloroform or acetone, which have a negative impact on the environmental and are a high-cost part of the production process.